Chiffonade -- pronounced "shif-oh-NOD" -- is a knife technique used for cutting herbs and leafy vegetables such as lettuce into thin strips or ribbons. To chiffonade leaves of basil, for instance, you would stack the basil leaves, roll them into a tube and then carefully cut across the ends of the tube with your knife to produce fine strips. "Chiffon" means "rag" or "cloth" in French, so making a chiffonade translates essentially to making rags, usually of leaves of basil, mint or other greens, according to Kitchensavvy. "Chiffonade" translates literally to "in rags," but it might be easier to think of chiffonade as "little ribbons," which could be an alternate translation of this Fench term. The term is technically a noun, according to Merriam-Webster, meaning "shredded or finely cut vegetables or herbs used especially as a garnish." Indeed, the term chiffonade is so entrenched in the lingo of culinary arts that author P. A. LaFraise wrote a 2014 book using the word -- "Chiffonade" -- as the title. The book chronicles the adventures of New York native and best-selling author Blakely Ellison as she struggles to cope with the tragic dissolution of her marriage. Tellingly, the cover of the book displays a pile of shredded veggies -- or veggies chiffonade -- with a knife menacingly struck through the pile into a cutting board. After stacking and rolling up mint leaves into a cigar shape, for example, you can use the chiffonade technique to slice the leaves into thin strips. You would use a sharp knife to cut the bundled mint leaves into thin slices, which would form delicate, green ribbons. You can then use the mint chiffonade to flavor and/or garnish dishes. Sprinkle it on soups, toss it on top of salads, stir it into dips or just use the veggies chiffonade to decorate a plate. 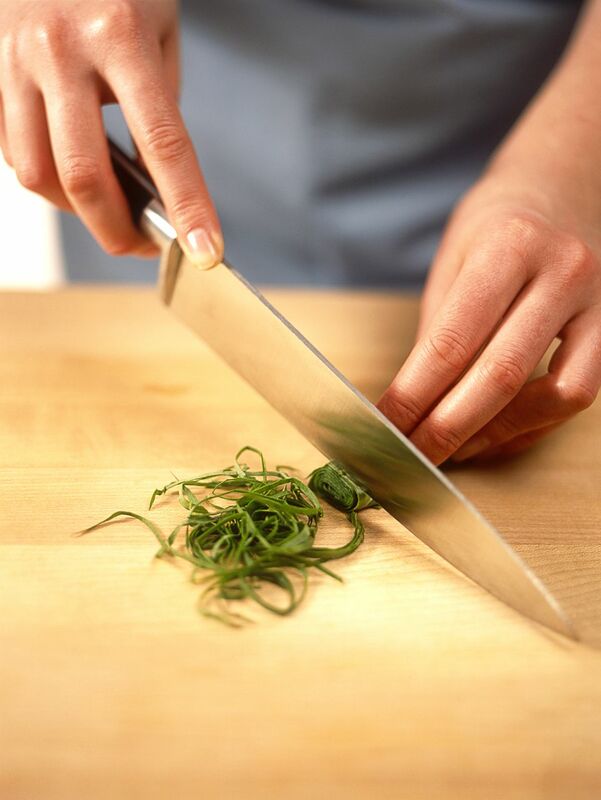 If you do employ this cutting technique, use the chiffonade vegetables and herbs immediately after cutting them, says Restaurant Supply Blog, a restaurant-industry website. "The cutting technique causes the edges to quickly darken," the website notes. "The technique is best suited for broad-leaved plants that can roll well. It would be very difficult to try this cut with something like parsley, which has a very irregular leaf." The blog says you can even chiffonade unexpected foods like crepes, and then add the crepe "ribbons" to soups. The key to the proper use of the chiffonade technique is: Use a sharp knife; take care not to cut yourself and use the chiffonade -- whether it be ribbons of veggies or crepes -- immediately. So, grab your knife as well as your spinach, basil or mint -- or even a crepe -- and you will be using the chiffonade technique like a professional chef in no time.